Lactic Acid Market and Polylactic Acid Market to reach US$ 3,381.8 Mn and US$ 1,358.1 Mn respectively by 2023. A growing number of players are capitalizing on the opportunities arising out of the substantial popularity of biodegradable plastics and bioplastics where lactic acid and polylactic acid are used as raw materials for their production. Some of the leading players in the global lactic acid market and polylactic acid market are Futerro SA, Teijin Ltd., Zhejiang Hisun Biomaterials Co., Ltd., Synbra Technology BV, Archer Daniels Midland Company, Henan Jindan Lactic Acid Technology Co., Ltd., NatureWorks LLC, and Corbion NV., notes Transparency Market Research (TMR). 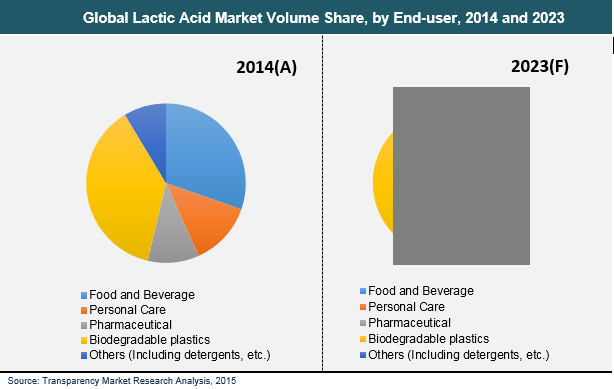 The global lactic acid market stood at US$1,130.4 Mn in 2014 and is estimated to reach US$3,381.8 Mn by the end of 2023. This represents the market to rise at robust CAGR of 13.0% during 2015–2023. On the other hand, the global polylactic acid market stood at US$400.1 Mn in 2014 and is projected to reach a worth of US$1,358.1 Mn by 2023 end. Polylactic acid market is projected to proliferate at a CAGR of 14.6% during the same forecast period. The various application of lactic acid are in the area of food and beverages, personal care, pharmaceutical, and biodegradable plastics. Of all the segments, biodegradable plastics led the global market in 2014 and is anticipated to rise at the most attractive growth rate over the assessment period. The various end-use segments for polylactic acid are packaging, textile, electronics, automotive, and biomedical. Of these, packaging witnesses the major quantum of demand and is expected to display the dominant growth rate over the forecast period. On geographical front, North America accounted for the dominant share of the global lactic acid market in 2014. The substantial growth of this regional market over the past few years is attributed to the extensive demand for bioplastics. On the other hand, the Asia Pacific polylactic acid market is expected to witness the leading growth rate in the coming years. The extensive application of lactic acid in the food and beverages and pharmaceutical industries world over is a key factor driving its demand. The rising application of lactic acid as a key carboxylic acid increasingly used in the manufacture of biodegradable is accentuating the global lactic acid market. The rapid advances being made in downstream application of lactic acid notably in making bio-based plastics is boosting the market. The substantial usage of lactic acid in making biodegradable polymers is imparting a robust and sustained fillip to the growth of the market. The demand for lactic acid is witnessing considerable impetus from the rising popularity of bioplastics world over. This is on account of the mounting concerns of devastating effects of plastics pollution all over the globe. Moreover, the extensive usage of lactic acid in making a variety of personal care products is propelling the growth of the lactic acid market. The polylactic acid market is driven majorly by the extensive application of this biodegradable polymer in the packaging of food and beverages, apart from its potential usage for making textiles. The copious demand for the acid in the textile manufacturing industry is fueling the growth of this market. The attractive demand for polylactic acid as a potential substitute for fossil fuel-based plastics has opened many a lucrative avenues over the past few years. Furthermore, the substantial usage of polylactic acid in the electronics, consumer goods, and biomedical industries is adding sizeable revenues to the global polylactic acid market. The study presented here is based on a report by Transparency Market Research (TMR) titled “Lactic Acid Market and Polylactic Acid Market (Lactic Acid End Use - Food and Beverage, Personal Care, Pharmaceutical, Biodegradable Plastics, and Detergents); Polylactic Acid End Use - Packaging, Textile, Electronics, Automotive, Biomedical, and Printing) - Global Industry Analysis, Size, Share, Growth, Trends and Forecast 2015–2023”.